As readers of this column may have already guessed, Russian foods come in all shapes, sizes and variations of complexity. There is, however, one feature shared by most, if not all, Russian cuisine - the ability to serve as the perfect accompaniment to vodka. Having vodka without food is considered the province of amateur drinkers and alcoholics. A true connoisseur will always have something on hand to nibble after downing a glass - whether it's only a lone pickle or piece of black bread, or something as wonderfully complicated as kholodets, the jellied meat dish that has long been considered the perfect sidekick to Russia's national tipple. 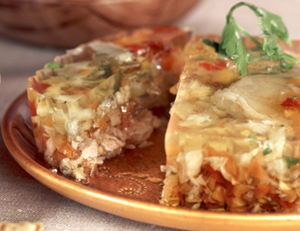 Kholodets (the name comes from kholod, the Russian word for cold, because a kholodets must be chilled before serving) resembles a rectangle of jelly several inches high, containing pieces of meat and vegetables. It is served both as an appetizer, where it is often presented on a plate with cold cuts, or as a main course. In either case, it is always eaten with a generous helping of horseradish or mustard, which is part of its appeal to vodka drinkers (the strong flavor of the kholodets and the spiciness of the horseradish help the vodka go down easier). As with many Russian dishes, the origin of kholodets is shrouded in the mists of time. Its recipe, however, is no secret - although it does vary by region and even household, with pork, chicken and beef all being used, sometimes in combination. Here's a recipe for a delicious beef kholodets with a spicy kick that you can enjoy with or without a bottle of ice-cold vodka. 1. Thoroughly clean cow legs with brush. 2. Put cow legs into a pot of cold water and set it over a high flame. Several minutes after it's boiling, successive layers of foam will rise to the surface (first blackish gray foam, then white). Skim these off with a strainer spoon. 3. When the foam subsides, cover the pot with a lid, leaving only a small crack for steam to escape. Lower the flame, and let boil until the meat is ready to come off the bone and the water turns a milky white. This usually takes at least 2-3 hours. For a firm kholodets, it is very important that the broth not be taken off the fire too early. The best method for testing the broth's readiness is to take a spoonful, let it cool and then smear it on your lips. If your lips momentarily stick together, you can be assured that your broth is ready. 4. Add salt. It is a good idea to oversalt slightly, as the carrots and eggs you will soon add will absorb some of the salty taste. 5. Strain broth into another pot, separating it from the meat. 6. Place eggs and carrot slices into an aluminum tray at least 2-3 inches deep. 7. Slice meat into bite-sized pieces and place into the aluminum tray. For a truly delicious kholodets, extract the bone marrow and add it along with the meat. 8. Squeeze garlic cloves into broth. 10. Pour broth into aluminum tray and let cool. 11. Refrigerate for 24 hours. Do not put into freezer! A successful kholodets should have a solid, slightly jiggly consistency, a bit firmer than Jello. 12. Garnish with parsley. Cut into square slices, and serve with a side of mustard or horseradish. It tastes better than it looks: kholodets is meant to be eaten, and not kept on the table as a decoration.